HD Brows is a seven-step procedure, which involves a combination of techniques including eyebrow tinting, waxing, threading and make-up application to give the illusion of very defined brows. Before your treatment begins, your therapist will assess your face shape and colouring before creating a bespoke brow, tailored exclusively for you. For this reason, no two sets of HD Brows should ever be the same. You shouldn’t view HD Brows as a single, one-off treatment, however, as it’s best viewed as a longer-term course of treatments. For example, like many clients these days, you may want thicker, fuller brows, either because you overplucked your brows when you were younger, or because your brows have become naturally thin and sparse with age. Although we can’t make your brows physically thicker during your first HD Brow appointment, we probably can make them thicker over a course of appointments, but this will require some time and investment from you. As part of your HD Brows appointment, your therapist is likely to use use make-up, either to fill in any gaps in your brows or possibly to make them look thicker and more defined than they naturally are. Remember that this make-up will wash off, so if you’re keen to replicate the look we achieve in the salon, you can buy the products which will enable you to replicate the look at home. How are HD Brows different from a normal eyebrow reshape? An HD Brow appointment typically lasts around 40 minutes in contrast to an eyebrow wax or thread appointment which will last about 10 minutes. So HD Brows is a much more detailed, comprehensive appointment than a standard brow reshape appointment. Methods such as face-mapping will be used to create and measure your HD Brow shape, whereas a standard brow reshape will be measured by eye. Unlike standard brow appointments, HD Brows also involves the use of make-up products at the end of your treatment, which will serve the purpose of masking any redness caused by waxing or threading, as well as using colour either to fill in where your natural brows may be patchy or to really help define your brow shape. If your brows are already in great shape, than an HD Brow appointment may not be necessary, and you may only need an eyebrow wax or thread plus a brow tint. If you’re unsure about whether to book in for a normal brow reshape or HD Brows, please speak to one of our expert, friendly team before booking. How can I get the best results from my HD Brow treatment? Firstly, we’d strongly recommend that you give us something to work with! By this, we mean that you should grow your brows back in for as long as possible before your treatment, ideally a minimum of 4 weeks to get the best results. If you have less regrowth, you will be limiting the results we can achieve. You should also have a think beforehand about what kind of brows you would ultimately like to achieve. For example, would you ideally like thick, thin or tapered brows? Do you have an ideal shape in mind, such as arched, flat or curvy? And what overall look would you like for your brows? Dramatic, glamourous or natural? Your therapist is an expert so can make recommendations but she isn’t a mindreader! Any help or guidance you can give her about your expectations will help you both. Finally, we’d ask you to be realistic in your expectations. You can’t go into a salon with sparse, overplucked and underconditioned brows and expect to leave, less than an hour later, looking like Cara Delavigne. If you want to see dramatic changes in your brows, then please be realistic about the time and commitment from you that this will take. Is HD Brows a permanent treatment? No, like standard eyebrow shaping and tinting appointments, HD Brows is a semi-permanent treatment, whose results will last for 3 – 6 weeks. Over that time, your brow hair will grow back and you’ll need to come back to have it reshaped. Likewise, because the tint is semi-permanent, it will fade over subsequent weeks and you’ll need to get your brows re-tinted at every HD Brow appointment. Does HD Brows make my eyebrows thicker? We can’t make your brows thicker on your first appointment, no, as we can only remove the hair as opposed to adding any hair! However, we can make your brows look thicker at your first treatment by tinting them and improving their shape. We can also help make your eyebrows appear thicker by teaching you clever make-up techniques using a range of HD Brow make-up products. We will apply make-up to your brows during the treatment and the products will available for you to buy from our Nottingham salon to replicate the look at home if you wish. It’s possible that we can try and help you achieve the brow look you want over a period of time, including thickening your brows up. However, you should be aware that it may take 5 or 6 treatments to achieve the desired look and you will have to follow our advice, which will inevitably include no plucking or fiddling about with your brows in between treatments! We can also advise you on a range of brow regrowth products which with the correct use should make your brows grow back thicker and bushier over time than they ever were. Do I need a patch test for HD Brows? Yes, you need a patch test at least 24 hours before your first HD Brow appointment with nkd. Even if you have had patch tests or HD Brow treatments carried out at other salons in the past, we will still need to perform a patch test prior to your first HD Brow treatment with us. You do not need to book a patch test in advance, you can simply turn up during our opening hours. We’re sorry but no patch test, no appointment. If you have a future HD Brow appointment booked with us, and we’ve been unable to contact you for a patch test (e.g. if you don’t pick up the phone or reply to our messages) we will cancel your appointment out of the book the day before your appointment. A typical HD Brow appointment at nkd will last for around 40 minutes. How long does HD Brows last for? The results of your HD Brow treatment will last for 3 – 6 weeks, after which time your tint will have faded and the hair will have regrown. You would then need to return for a repeat appointment to maintain the look. Can I buy HD Brow make-up products to use at home? Yes, you can buy all of the HD Brow products we use during your treatment to use at home. Our favourite HD Brow products are the HD Eye and Brow Palette, the HD Brow Define and Browtec pencils and the HD Brows Colourfix gel. These are all fantastic products which will keep your brows looking perfect for weeks after your treatment with us. Can men have HD Brows? Absolutely, yes! For a lot of men, make-up will not be used during your HD Brow appointment, although of course we can use make-up to define the look if you’d like. Generally speaking, men will also be given a more natural-looking shape than women, although again this is completely down to personal preference! What’s the best way to book an HD Brow appointment at nkd Nottingham? You can ring 0115 924 1454 and speak to one of our friendly receptionists when we’re open, or leave a message if we’re closed, and we’ll call you straight back the next morning. You can email us on info@nkdwaxing.com, with details of which treatment you’d like and when, and we’ll reply ASAP. You can book an appointment online here, but if you can’t find what you’re looking for with online booking, then we’d recommend that you give us a ring. Or of course, you can pop by our lovely salon and book in person! Regardless of how you book, remember that if it’s your first HD Brow appointment at nkd, you will need to visit the salon at least 24 hours’ before your treatment for a patch test and to make a prepayment. If we’re unable to contact you about your patch test and prepayment and we don’t hear from you, we reserve the right to cancel your appointment out of the book. Once you’ve been for your first HD Brow treatment, we recommend that you book your next appointment before you leave the salon, so you can be sure of securing your preferred day and time. Why do I have to make a prepayment ahead of my first HD Brows treatment? We request prepayments ahead of certain longer and more expensive treatments, including all appointments with a value of £35.00 or more in order to secure your booking. This includes first-time HD Brow appointments. Unfortunately, we do get a high number of clients who make bookings and then who fail to turn up for their appointment. If you do not turn up to your appointment, or if you cancel or rearrange at unreasonably short notice, thereby not giving us enough time to fill the slot with another full-paying client, we will retain your prepayment. If you turn up so late to your appointment that we are unable to carry out the full-treatment you were booked in for, we will also retain the prepayment. We will ask for a prepayment at the time of booking your appointment. If you decline to make a prepayment at this time, or if you book online or by email and we are unable to contact you within 24 hours of your appointment to take a prepayment, we reserve the right to cancel your treatment. We hope you are not offended by our policies and that you understand the measures we must put in place to protect ourselves as a small independent business with high city-centre overheads. We request a minimum of 24 hours’ notice please if you wish to cancel or rearrange an appointment. If you do not turn up to your appointment, or if you cancel or rearrange at unreasonably short notice, thereby not giving us enough time to fill the slot with another full-paying client, we will retain any prepayment that we hold on file for you. If you turn up so late to your appointment that we are unable to carry out the full-treatment you were booked in for, we will also retain the prepayment. If you wish to cancel your appointment with more than 24 hours’ notice, we will happily refund any prepayment we hold on file to you. Whereabouts in Nottingham do I find nkd? 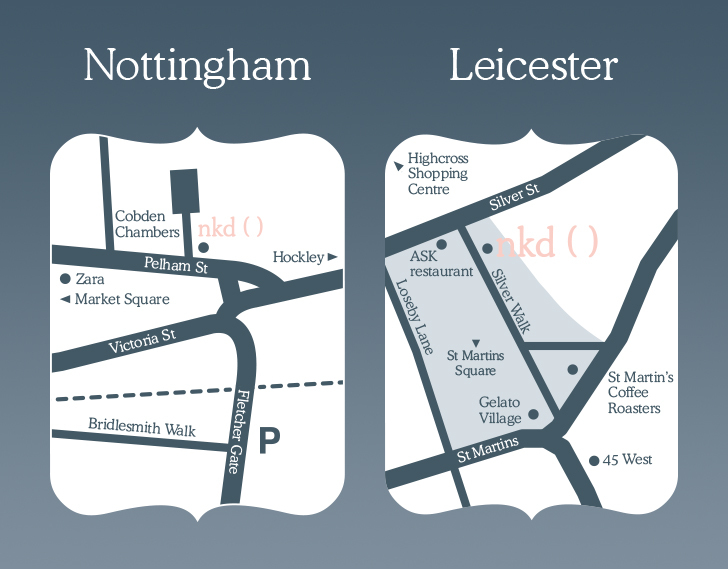 nkd is located in Nottingham city centre at 27 Pelham Street. Pelham Street is the hill that runs up to Hockley, from the city centre. So if you’re walking from the Market Square, you walk up the hill, keeping Zara to your right. You will pass Space NK, Sweaty Betty and Homemade café on your right hand side, and Thurland Street on your left. We’re further up the hill on the left, before you reach Hockley. We’re opposite Wired Café and Bodycraft Tattoo Parlour and next to Michael Levin, the jewellers. I’m running late for my HD Brow treatment, what should I do? You need to call us on 0115 924 1454 to keep us informed of your movements. If we can move your appointment time back, we will do, but if we have another client booked in immediately after you and no other HD Brow-trained therapists are free, we’ll be unable to do this. Depending on the time of arrival, late arrivals may be offered a reduced treatment (e.g. a brow wax and/or tint) or turned away altogether, but you would still be charged in full for the original appointment booked. Why do I need to arrive 5 – 10 minutes before my first HD Brow appointment? If you’re a first-time client, you should arrive 10 minutes before your appointment time to fill out a consultation card. This will involve you giving us your main contact details and any basic medical details we need to know about (e.g. whether you have sensitive skin or any known allergies, eczema, have used acne creams on the area, are pregnant, etc). Your therapist may speak to you about the information you have given us on this card in private before your treatment starts. For subsequent appointments as a repeat client, we politely request that you arrive 5 minutes before your appointment time to ensure a prompt start. Do I need to book an HD Brow appointment in advance, or can I just walk in? It’s highly unlikely that we would be able to accommodate a walk-in HD Brow appointment. We’ll always try and accommodate them where we can, but the reality is we’re usually so busy that we can’t! As such, our advice would be to always give us as much notice as you can to avoid disappointment. Can I have HD Brows if I’m pregnant? Absolutely, yes! You should bear in mind, however, that throughout pregnancy, your skin may be more sensitive than usual so the waxing and threading part of your treatment may feel more uncomfortable than it otherwise would. Please make sure you tell us if you are pregnant, even in the early stages, as it’s important that we keep your medical notes up to date on our consultation cards so that we can always treat you in the safest and most-effective manner. Can I get a student discount on my HD Brows in nkd Nottingham? Yes. We offer 10% to students every Tuesday/Wednesday/Thursday before 4pm. There are no student discounts on a Monday, Friday and Saturday or in the evenings. Please bring an up-to-date and valid student card with you to every appointment. We’re sorry, but no student ID, no discount. How else can I save money on HD Brows at nkd? We do a range of special offers and promotions, most of which are aimed at rewarding and thanking our existing clients for their loyalty and custom. Please note that only one special offer, promotion or discount can be used on any single visit. For more details of all of our promotions and to read the full terms and conditions, see our special offers page. Why should I choose nkd Nottingham for my HD Brows? Because nkd was one of the very first salons to bring HD Brows to Nottingham and we’re confident that we’re still the best. HD Brows is one of just a handful of treatments that we carry out and because of this specialism, your HD Brow treatment at nkd Nottingham will generally give you better results than an HD Brow treatment from a generalist beauty salon, which tend to be jacks of all trades and masters of none. There’s a reason that we don’t offer other beauty treatments such as massage, nails and facials at nkd and that’s because we recognise that we can’t possibly be experts in everything. So we’d rather offer a very specific range of treatments and be very, very good at those treatments, rather than offer a wider range of options but not be specialists in any of them. We have extremely high professional standards at nkd and place a huge amount of emphasis on internal staff training to ensure that no therapist ever slips into bad habits behind the privacy of her treatment room doors. We send out a post-treatment survey to every client after every visit, which is tantamount to continuously mystery shopping ourselves. We read each and every response we receive and we take action where necessary. To date we’re thrilled to have received some 5,000 survey responses, the vast majority of which are overwhelmingly positive. That’s why we’re confident that once you’ve got nkd, you’ll never do it anywhere else!